Coal Action Network Aotearoa today called for the Government to “get real” about the future of coal. 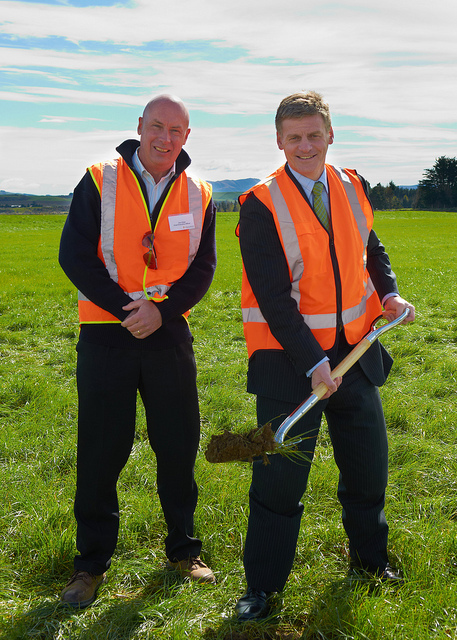 Former Solid Energy CEO Don Elder and Finance Minister Bill English turn the sod for Solid’s failed lignite briquetting plant in Southland. Solid Energy going into administration is good for the workers currently employed by Solid Energy in the short term, but the future of coal is looking bleak. The Government has continually failed to face the reasons for Solid Energy’s freefall in recent years. It pushed the company into an untenable position by changing policies such as the mandatory biofuels regulation, and backed the its failed and highly irresponsible plans to mine billions of tones of Southland lignite. What’s more, the Government continued to insist that Solid went into more debt, all the time ignoring the plummeting coal prices. “Coal is on the way out. If the Government had woken up to this fact a few years ago, a serious discussion about a Just Transition away from coal would already have been well underway,” said Baxter. If Solid Energy’s assets are sold to international interests, what happens to the remediation of the mine, and promises made to the Government in the Solid Energy consents? There are also concerns about any assets – such as undeveloped mines with permits – also being sold off to international interests and being developed. Despite the continued failure of the Government’s “mine it, dig it, drill it, burn it” strategy, Energy and Resources Minister Simon Bridges recently announcedfurther Government support for mining. Coal Action Network Aotearoa is opposed to new and expanded coalmines, but says that Solid Energy’s existing mines should be maintained until their current permits run out. Well Bernie, perhaps they can use wood waste and not poison the air – the idea of using coal to heat a hospital is a contradiction in terms, given how many pollutants they emit, how much asthma they cause. Feel very sorry for people in Invercargill breathing that filthy air. Good points. It’s a pity that wood waste is still close to three times the price of coal per unit of heat output, however, advances are being made in availability and reliability of supply, handling and storage. Options are also being explored in burning both coal and biomass to reduce emissions while managing costs. This is certainly a space to watch. Bernie, you are bringing an engineering approach to an ethical problem. When slavery was abolished, there would have been plenty of people like you wringing their hands in dismay about how the cotton was to be picked and so on. The bottom line is that burning coal to fulfill the needs you mention is irresponsible, not only because of the obvious pollution, carbon emissions, worker deaths in mines etc, but because coal is finite, and continuing to depend on it just shifts the burden of transitioning to other energy sources to future generations. We can, and must, replace coal with renewable resources, NOW.